City of Novhorod-Siversky | See you in Ukraine! The pearl of the city is rightfully considered monument of Old Rus architecture, the Spaso-Preobrazhensky men’s monastery founded by Prince Mstyslav Tmutarakansky in 1033. Historical sources say the monastery was the starting point of the famous campaign to the land of the Polovians of Prince Ihor of Novhorod-Siversky, the hero of “The Tale of Ihor’s Campaign”, the first literary monument of the Eastern Slavs. 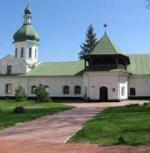 The territory of the monastery is the place where a reserve museum called “The Tale of Ihor’s Campaign” operates; it has priceless treasures and is unique, being the only one in the world, and not just Ukraine. The impeccability of the Spaso-Preobrazhensky Cathedral in the heart of the monastery is captivating. The cathedral was built according to a project of famous Italian architect Giacomo Quarenghi. His works also include such unique historical monuments as the Hermitage Theater, the Academy of Sciences on the Neva embankment, the Smolny Institute in St. Petersburg, and a manege in Monaco. Many known personalities are connected with the history of the Spaso-Preobrazhensky Cathedral. There, at the end of 16-th century, Grigory Otrepyev, who pretended to be a son of Ivan Grozny (the Terrible), found his last refuge. Monuments erected in honor of historical personalities charm people with their grandeur. There is a monument to Prince Ihor on the city square; Yaroslavna cries near the monastery walls above the Desna River. A helmet with spring water was erected in honor of Yaroslav the Wise. The Triumphant Arch, built in honor of the visit of Catherine the Great in 1787, amazes people with its beauty. A gymnasium named after Kostiantyn Ushynsky was restored in the city – he was the founder of scholastic pedagogics in Russia. When you visit the city, you can accommodate yourself in a wonderful hotel called the Slovyansky, located on a picturesque bank of the Desna River and which corresponds to the four-star standard.